The MA-nine(TM) Irons use our Proprietary 431-9 stainless steel, material that matches the feel of forged steel while maximizing forgiveness, playability and distance. Engineered by top club designer, Mark Adams, the MA-nine(TM) clubs are precisely tuned for optimal balance and weighting - delivering a level of power and accuracy that most golfers have never experienced. The MA-nine(TM) Irons are designed to win! The 431-9 stainless steel provides a forged feel with an extremely hot clubface and unbeatable distance. 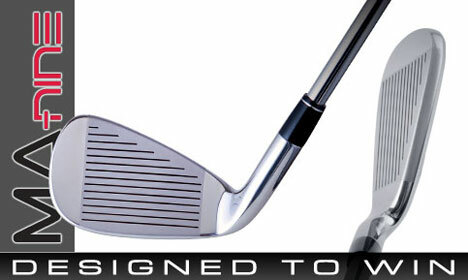 Plus the Deep Undercut Cavity gives these irons accuracy, forgiveness and a HUGE Sweetspot that's TWICE AS BIG!! The low center of gravity along with evenly distributed weighting, makes the large sweet-spot easier to hit. 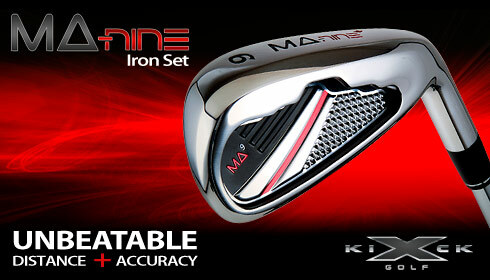 The MA-nine(TM) Irons deliver an unmatched level of forgiveness, accuracy and power!